If you aren’t a professional photographer, but still value image quality and features in your drone, the DJI Mavic Air offers the best combination of portability, ease of use, and camera specs on the market. The drone by itself usually costs $799 (it’s currently $750 on Amazon though), but today, that’ll get you the Fly More Combo for $850, including a carrying case, extra cables and adapters, propeller guards, spare propellers, and (this is key) three spare batteries. That’s an all-time low price for the bundle, which normally costs $1,000, and even then is well worth the premium. I had a chance to fly one of these at Outpost this year, and as an old Phantom 2 owner, I was completely blown away. It folds up small enough to fit in a jacket pocket, but holds remarkably still in the air. 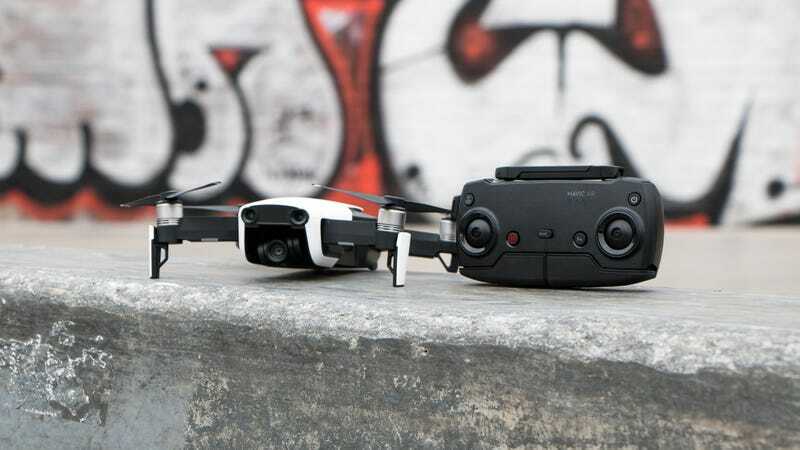 Front and rear obstacle avoidance cameras keep it from crashing into a tree (or a person), and its gimbal-stabilized 4K camera can automatically track moving subjects, or perform pre-programmed shooting routines. You’ll have a ton of fun with this thing.